CAREER OPPORTUNITIES – WHY CHOOSE US? 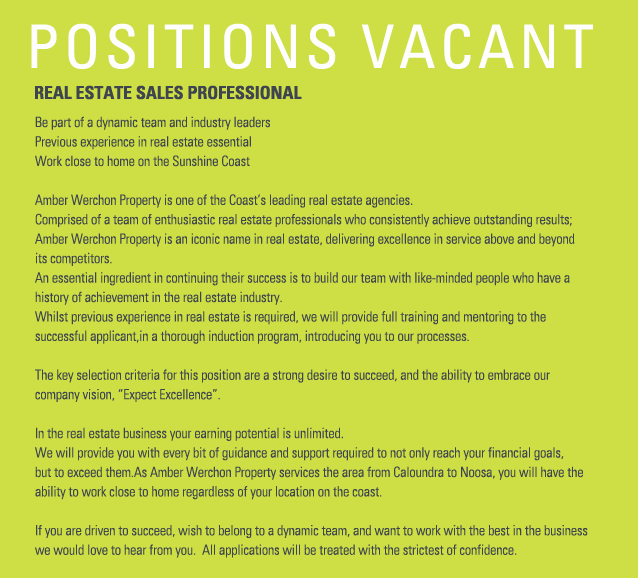 We set the standard that others try to emulate; so whether you’re starting on your career path or looking for a new direction, join Amber Werchon Property and become part of a winning team. Amber Werchon Agents are offered a choice of working as an independent agent on a higher commission rate, or working within the office environment with full use of office resources including outstanding administration support. • Career progression, including building equity in the rent roll. We are a young, dynamic and innovative team committed to delivering excellence in all facets of the business and pride ourselves on the quality of our staff. We will help you to realise your goals – we will work together to create success!